Good for tailgating and any party event. Cannot be combined with a lamp shade though. Probably a new head for sale during 2012 Brewfest. Like the new head they added during Midsummer. Sadly those are only temporary like the Synthbrew Goggles. We can only hope to get a permanent version, too. This needs to be a permanent feature, because it is without a doubt the greatest thing ever. Show up for a heroic raid, Two tankards attached, It's game time. Clearly created by the Dwarves for... Dwarven purposes. And Ghostcrawler said they were doing away with head enchants. This is the greatest head enchant of all. This costs a whopping 2 Brewfest tokens. It applies a buff that I'm guessing works exactly the same as the head change for 브리쿨 뿔잔. Get rid of the brewfest requirement. This is going to gather dust in our bank for 11 months, cause of "Requires Brewfest". Available for purchase from the Brewfest vendor for 200 tokens, earned by completing daily Brewfest quests. This should be a helmet such as the blixs enhancement goggles. It would cost 100 tokens and be 20 times as epic. I bought it just for the effect but it would be nice if it was an actual helm. I was really disappointed that this didn't let you attach two of your actual Souvenir Steins from previous Brewfests to your helm. Since they removed proper head enchies Blizz should make novelty enchies like this to be permanent! This'd go great with... ANY rogue outfit or be very *ironic on a huntard. Brewfest has been over for nearly a week now and this thing still shows on my character's head, even though it is no longer in my inventory anywhere. I've tried logging out, then back in again, changing head gear...even changed the "Display Helm" setting. Nothing makes it go away. Guess I'm stuck with it for good. November 17 and my pandaren monk still has this on. No complaints though, I'm glad the buff didn't wear off after brewfest. What's better than beer attached to your head? TWO beers attached to your head! I would pay MANY Brewfest Tokens for a permanent one of these. Please, please, Blizzard! Need a permanent version. Since the datamining for 2015 doidn't show it I guess we still have to wait/hope for it. I echo the sentiment shown on this page. A transmoggable version of this would be perfect for my warrior! This hat says: I'm #1, and I let gravity do my drinking. It's serves no practical purpose, It is simply for cosmetic use, Or you know, looking like a True Brewfester. Or a pathetic drunkard. Whichever floats your boat! 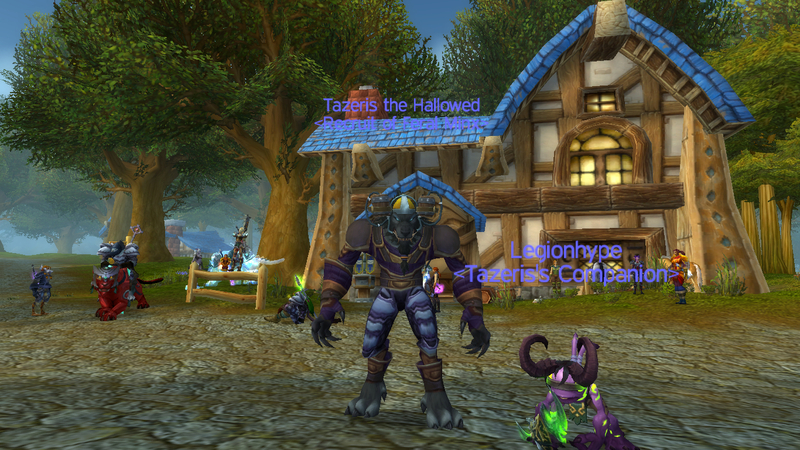 Okay so I don't know if it's a bug or if it's intended, but I still have my Brewhelm on my Druid & it's November. I uploaded a screenshot of him along with the 2015 Blizzcon Murkidan to show that it really is November (I used my Murkidan as a marker because he was sent to everyone that bought a Blizzcon ticket on the first day of this years Blizzcon (which was November 6th)). I'm hoping the Brewhelm will stay indefinitely. But if it does disappear I will update this comment. Also i'll add info like if it persists through death (I hope so), entering and/or leaving a dung/raid once I find out. Edit: In case my screenshot gets denied here it is. 사용 효과: 술잔 두개를 머리나 투구 위에 붙입니다.